Adjunct Curator, Burke Museum Co-Author of "Manual Of The Living Conidae"
Principal Investigator Of "The Conus Biodiversity Website"
First of all, I extracted from the Washington University (Biology Department) website this text from Alan, as it is very helpful for the ones that might not know him : "The general aim of my research is to increase understanding of the evolutionary processes that have led to high biotic diversity in tropical marine environments. Its more specific goal is to elucidate important evolutionary trends in diversity, morphology, distribution, and ecology of one of the largest families of marine molluscs, the Conidae, from its early Cenozoic origin through the Tertiary and Quaternary periods. The focal genus Conus is particularly important because of its immense size (about 500 extant and at least as many extinct species), its extensive range of variation in diversity, geographic distribution, ecology, and development, and its highly neurotoxic venoms. Current research efforts emphasize the evolution of taxonomic diversity, Tertiary marine paleoecology, and relationships between larval developmental mode and biogeographic patterns. Prior to my retirement, some of my graduate students addressed similar questions in their research, but most developed independent studies in diverse areas of functional morphology, ecology and distribution of a variety of local as well as tropical marine invertebrates. Currently, a postdoctoral researcher is using molecular genetic methods to generate hypotheses of the phylogenetic relationships of Conus species. Undergraduates in the lab are studying shell and radular tooth morphometrics. These data will be used to better understand the feeding process in Conus and to test phylogenetic hypotheses resulting from the gene sequences." "This web site is part of a National Science Foundation-sponsored project aimed at expanding knowledge of systematics of the unusually diverse marine gastropod genus Conus. The project goals are to integrate species-level revisionary systematics of the major regional faunas, contribute to molecular-based phylogenetic hypotheses, expand predictive classifications, and promulgate the results in both electronic and print media"
I would like to thank several cone shell lovers that helped me with this interview : Giancarlo Paganelli, Paul Kersten, Marco Bettocchi and Carlie White for english correction. 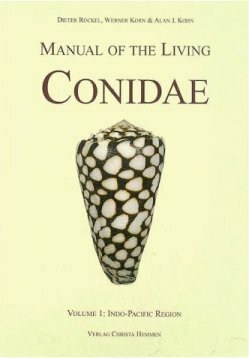 It is my honor to interview such a major specialist in Malacolgy, as well as, the co-author of "Manual of the living Conidae"; which is one of the best cone shells related books that I have ever read. I would like to thank you and your co-authors, in the name of all cone shell lovers, for this spectacular revision of Indo-Pacific Cone Shells. Thanks, Alan ! Would you tell us more about your actual activity and main projects concerning the Conidae family? Almost all of my research over the years has focused on molluscs, and most on Conus. Of course it is only one of thousands of molluscan genera, but I argue that it is the biggest and the best. With more than 500 species, Conus is the most diverse genus of animals in the sea. Another way to say that is evolutionarily, Conus is the most successful genus at producing new species, and it has diversified more rapidly than any other genus of shelled molluscs, as Steven Stanley demonstrated many years ago from study of both fossil and recent species diversity. Most of my research has been in the Indo-Pacific region and has focused on how Conus species make their living, how such large numbers of species can coexist in the same environment without competing with each other for the resources they need (food and space for example), and why some habitats support more species, that is have higher biodiversity, than others. Along the way I have had to study Conus taxonomy, because one must determine the correct species names in order to communicate the results of biological research. More recently I have focused more on the systematics and phylogeny of Conus, and how its adaptive radiation over evolutionary time can help us understand the evolution of high biodiversity in the tropics more generally. I've also studied development and life history of Conus, and shell and radular tooth morphology and morphometry, mostly in the Indo-Pacific region, in order to better understand the biology of the animals in nature. As a university professor, I taught mainly courses about the biology of marine invertebrates, a much broader area. And some of my research has been on other carnvorous gastropods such as mitrids, buccinids, and the parasitic taenioglossan Trichotropis, as well as a few studies of polychaetes, sipunculans, and tropical invertebrate communities. I also supervised the doctoral studies of 22 graduate students. Most of them did their research on marine molluscs (only one on Conus), but others studied the biology of other invertebrates, including crustaceans, polychaetes, nemerteans, and tunicates. A question that comes to mind, after reading the famous "Manual of the living Conidae" vol.1 (also know as "RKK" for Röckel, Kohn, Korn) which is one of the best and most recent publication about the Conidae family is : Do you have plans for a vol.2 ? There will be no Volume 2 of The Manual of Living Conidae. Neither Dieter Röckel, who started and led the project, and is even older than I, nor Werner Korn, who became a museum director, wished to continue. I think we did quite well in that book despite the "RKK" methodology (pronounce it "RKiK" = archaic). We used primarily 19th Century methods. Are you currently working on a revision of this Family? It is more rational to revise the various biogeographic regions separately, because there are so many species and there is so little overlap of species among regions. Are you working on a Caribbean project? We all know this area is a real treasure-trove concerning classification. My current major project is a revisionary systematic study of the Western Atlantic Conus species. This formidable project progresses slowly-at the proverbial but appropriate "snail's pace," for several reasons. First, the very complex geologic history of the Caribbean has profoundly affected the evolution and ecology of marine life in that region today, in ways that differ markedly from the Indo-Pacific region to which I devoted most of my career. Second, I have very little personal experience with the animals in nature there, in contrast with the Indo-Pacific. I studied the biology of Indo-Pacific Conus over a period of 50 years, and obviously I don't have another 50 to devote to the Atlantic fauna. Third, I don't have the benefit of working with my co-authors of the Indo-Pacific Manual. In addition to the Western Atlantic revisionary study, in collaboration with my former postdoctoral research associates, Tom Duda and Chris Meyer, as well as others, I continue to try to understand how the species of Conus are related genealogically or phylogenetically to each other. We published a couple of papers on this aspect in 2008; the citations are on the Conus Biodiversity Website, which of course is itself another ongoing project. Shell lovers can also thank you and your team (Trevor Anderson & Al.) 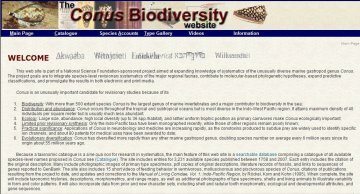 for the excellent website : The Conus Biodiversity Website. How did you get the idea for such a database? Actually it was not my idea. The U.S. National Science Foundation supported the study for four years (2003-07). It requested that grantees of revisionary systematics projects on all groups of organisms develop web sites on their taxa, so we complied. It turned out to be an excellent way to manage databases as well as to make information available and easily accessible to the world . The site has become more popular than I expected. It has been averaging over 60 visits per day, and in January, 2009, for example they came from people in 75 different countries. However, a web site is like a collection; without continued attention it deteriorates. And now that the NSF support has expired, Trevor Anderson's position has disappeared, and it has therefore become much more difficult to continue the site. Serious users of the site undoubtedly realize that it is no longer regularly updated. The NSF does not fund websites that it initiated after the grants expire. Fortunately the Burke Museum at the University of Washington continues to host the site, but unfortunately we lack funding to maintain and update the site. Are you, yourself, collecting shells? Would you tell us what are your ten favorite cone shells and why ? 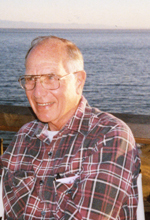 I did collect shells, from the time I was a child growing up near Long Island Sound in Connecticut until I joined the University of Washington faculty in 1961. At that time I also became associated with the Burke Museum, to which I donated my collection, of about 2,500 lots. It is not appropriate for a person affiliated with a museum to also maintain a private collection, because it establishes a conflict-of-interest situation. I will only name my one favorite Conus species: C. ebraeus, mainly because it is the most successful of all. The criteria for biological success vary with the category. At the genus level, Conus is of course the most successful in the sea, because it has the most species and occupies a correspondingly broad array of habitats and areas. For a species, criteria for success include how widespread it is, how abundant it is, and how many types of environment it can exploit. (This is why our species, Homo sapiens, is so successful on land.) C. ebraeus has the widest geographic range of any Conus species. It occurs throughout the Indo-Pacific region (1/4 of the world's ocean area), and it has also crossed the East Pacific Barrier to colonize the coast of Costa Rica. It has a planktonic larva that stays afloat feeding and growing for at least several weeks and can thus be transported widely by currents. Tom Duda and Haris Lessios have shown that its populations in widely separated regions have almost identical DNA sequences, indicating that they continue to interbreed. In several habitats it is also the most abundant species. And it occurs both intertidally and subtidally, on a variety of different substrate types, although usually associated with coral reefs or other habitats of reef origin. Another reason why it is my favorite is that I have been studying it off and on for about 55 years, and for most of that time it concealed a deep secret from us. C. ebraeus has a cryptic sister species whose shells we cannot distinguish from it. Tom Duda discovered this a few years ago (by demonstrating from its DNA sequences that it does not interbreed with C. ebraeus). We hope to finish a report on this situation later this year. What about your work on DNA tissues of cone shells species ? I am not a molecular biologist, so I work with others who are. I did require my last several graduate students to learn molecular methods, because they have become so useful in answering so many different kinds of biological questions that we just could not approach before the "molecular revolution." In this project Tom Duda and Chris Meyer did most of the molecular genetic work, and both continue research in this direction. We now have sequences of four genes for perhaps 40% of all Conus species (about 250). Not all of these results, as well as those of C. ebraeus 's cryptic sister just mentioned, have been published yet. It is heartening, however, that in about 98% of cases in the Indo-Pacific, the DNA results agree with our species-level, shell-based taxonomic decisions in RKK. Do you regularly have big surprises concerning actual nomenclature ? Nomenclatural surprises do seem rampant in Conus, but maybe they should not be so surprising. Since the publication of the "Manual", there have been many new Conus species uncovered. In your opinion, isn't there an inflation of n. sp.? Can your DNA investigation help you with correct identification? Yes, many Conus species have been described several times, but previously undescribed species also continue to be discovered and described. A too common problem is inadequate descriptions that do not distinguish (and sometimes seem not to try to distinguish) intraspecific variation from interspecific differences. Despite the increases in knowledge and technology, published descriptions have improved disappointingly little from Linnaeus's time to ours! I've tried over the years to help give guidance about how to describe species. One such account is on the CBW, and I tried to make my only new species description (C. kahiko) a model. But a small fraction of people who have described new species since then (1981) have paid any attention. One doesn't need to be a professional biologist or a Ph.D. to properly describe a new species. One does need a high school-level understanding of how evolution works, and access to and evaluation of all the previous descriptions of species in the genus. I know some non-professionals who have published quite adequate descriptions of new Conus species in the last 10-15 years. I think one problem is that somewhere some people who describe new species got the idea that some honor is attached to doing so. But there is no honor; there is only responsibility—the responsibility to defend the hypothesis that the new nominal species is really distinct. The late very distinguished Danish marine biologist Anton Fr. Bruun, whom I had the pleasure of knowing back in the 1950's, attributed this stuation to the decision that the species name should be followed by the author's name. This started when it was decided that zoological nomenclature should begin in 1758 with Linnaeus's species. In a letter to the editor of Science in 1950, Bruun called this "widespread mental disease among systematists" the "Mihilisme" and describers who think some honor accrues to the describer, "Mihilists." It would help greatly if all descriptions were published in peer-reviewed scientific journals. Then, referees of manuscripts would help less experienced authors to prepare adequate descriptions. But the International Commission on Zoological Nomenclature permits the names of species published anywhere to be available. Since Linnaeus many Authors attempted to subdivide the Family Conidae in Genera and Subgenera, but in spite of the great interspecific variation, the current trend is to gather all the species in the unique Genus Conus. But is this the right way ? Isn't there a complicated taxonomic problem to solve? If there is, we have not solved it yet. Many attempts have been made to subdivide the genus, starting with Linnaeus, as you said. In 1758, he divided Conus into four subgenera on the basis of quantitative characters of shell shape, or morphometry. A problem is that the schemes of different authors have been based mainly on single character sets: shell shape, shell sculpture, shell color pattern, radular teeth, or DNA sequences. Each basis gives rise to different logical but conflicting schemes. Because the generic/infrageneric classification is not yet resolved, it seems most rational to continue to consider all the species in a single genus. Of course these data also show that some species are more closely related than others, and some day a bright student may show that one scheme for subdividing the genus should be accepted because it explains most of the data on diversity and leaves out the fewest. This is of course how theories become accepted in all of science, and systematics is no exception. If someone wanted to help you by collecting tissue samples from live specimens, how would one proceed, and to whom should they contact? The simplest method is to place small tissue samples (we use a slice of fresh foot tissue of a few cubic millimeters) in 95% (190 proof) ethyl alcohol. The volume of alcohol should be at least several times that of the specimen, and the container should be tightly stoppered because alcohol evaporates. Samples can be sent to me or to Chris Meyer at the Smithsonian Institution. They should be accompanied by a photograph of the animal's shell and the usual collection data. 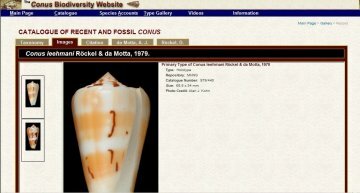 Chris keeps a database of images of shells of Conus specimens whose genes we have sequenced that is accessible from the Florida Museum of Natural History website. Ideally the shell itself and the rest of the preserved animal should go to a public museum as a voucher specimen where it will be accessible to future generations. What about the mystery of the presence of Conus pennaceus in Hawaii? I noticed you were in Hawaii in the end of 2008, with Chris Meyer DNA analyst, did you learn more about this local interesting specie/subspecie? Do you have records of C. pennaceus from other places in the Pacific area? C. pennaeus remains a mystery as you correctly say. What we call C. pennaceus is almost certainly a flock of related species. We know that egg size and reproductive mode, as well as shell form and pattern, differ in different geographic areas. In RKK, we separated Indian Ocean populations as C. madagascariensis. Even within Hawaii, where C. pennaceus lacks a planktonic larva, shells differ markedly from place to place. Some populations have reddish brown markings on the shells, in other places the shells are yellow and white. Some have long, narrow shells, while others are short and squat, etc. The extent of variation within the Hawaiian Islands is reminiscent of that among some Western Atlantic species that also lack planktonic larvae. But of course we lack adequate samples from all of these for detailed molecular genetic analyses. The operculum seems to be a rudiment. What is your opinion for the real function for this part of the animal? The operculum does seem rudimentary, and some species have been reported to have lost it entirely. I don't know that anyone has demonstrated that it functions in any way. If someone has, we would all like to hear about it. What causes color changes in the pattern. Conus regius with half of the whole in "citrinus" pattern and the other half the normal pattern? You are what you eat, and at least some individuals can be induced to change color pattern in captivity by changing their diet. I've done that with C. striatus in the laboratory in Seattle. C. regius seems to change patterns commonly during its life in nature. This likely is due to a change in diet, but we don't know this for sure. C. regius eats polychaetes of the family Amphinomidae ("fireworms") and different species in that family themselves have different skin pigments. What could be the reason for the nice pattern of conus as it cannot be seen normaly, because of the periostracum? The pigments of Conus shells are nitrogenous waste products of metabolism. Just as our kidneys secrete urea as our main nitrogeous excretory product, Conus kidneys probably produce the pigmented compounds. One can only speculate why they are sequestered in the shells. The patterns likely result from the rhythms of excretion and shell secretion, but little is really known about this also. As you say, the color patterns probably don't have any visual significance. Some are obscured by periostracum as you noted. Conus species that have a thin, translucent periostracum are those that tend to stay buried in sand during the day, coming out to forage at night when the patterns aren't visible. And those that are out in the open all the time typically have the periostracum covered with algae that obscure the shell color pattern. Does cannibalism appear in cone species ( ex. adults eating juveniles )? I don't know of any cases. Of course some Conus eat mainly other Conus. C. marmoreus and C. bandanus are good examples, at least in some regions. Members of some species do eat very similar species: I found radular teeth of a C. canonicus in the gut of a C. textile once. Also I once (only once) did an experiment in Hawaii keeping a large number of C. pennaceus in an aquarium for a long time. No cannibalism occurred. Are cones immune from their own poison? No, as the previous answer indicates. But remember that the venom must be injected to be effective. If a person or another predator eats a Conus, the venom molecules will be digested as food in the predator's gut. Other snails (e.g. Cymatium, naticids), some fishes, crabs and mantis shrimps, and people in several parts of Asia don't hesitate to eat Conus and are none the worse for the experience. I once taught a short course on the biology of Conus to marine biologists in Vietnam. Bad weather prevented much collecting, but the local market provided enough specimens and species for study.